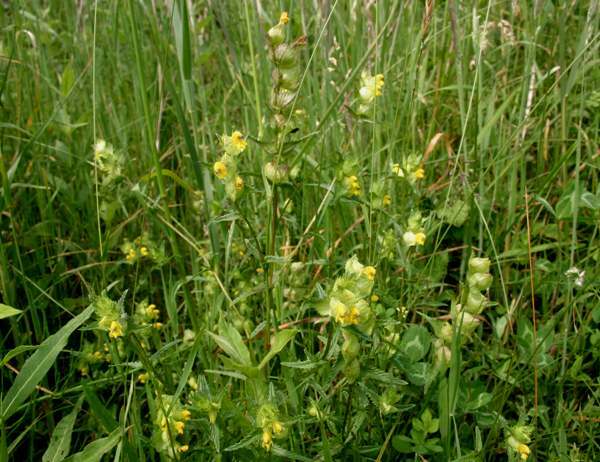 Yellow Rattle is an annual, usually growing to between 20 and 45cm in height. Its opposite, simple leaves have serrated margins and deep dark-green veins. 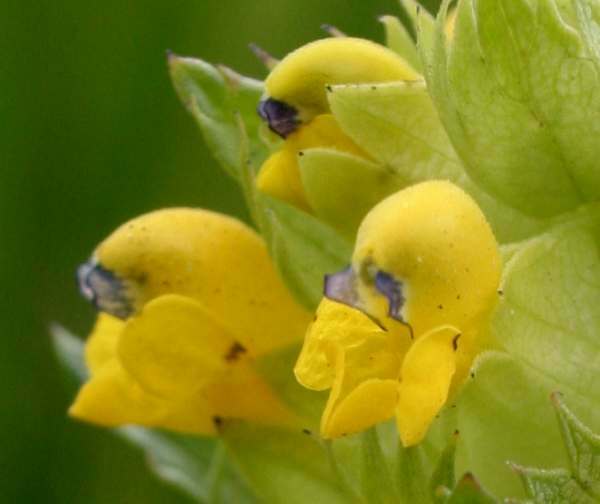 The yellow tube-like flowers, which protrude from an inflated green calyx, are borne in a terminal raceme. A distinctive feature of this grassland wildflower in autumn is the large dry fruit capsule inside which the seeds rattle in the breeze. This plant is widespread throughout Britain and Ireland, but it does not tolerate the application of fertilisers and other modern farming chemicals. Rhinanthus minor grows in undisturbed and unimproved grasslands and is, therefore, an excellent indicator that other special plants may be present - in particular wild orchids. 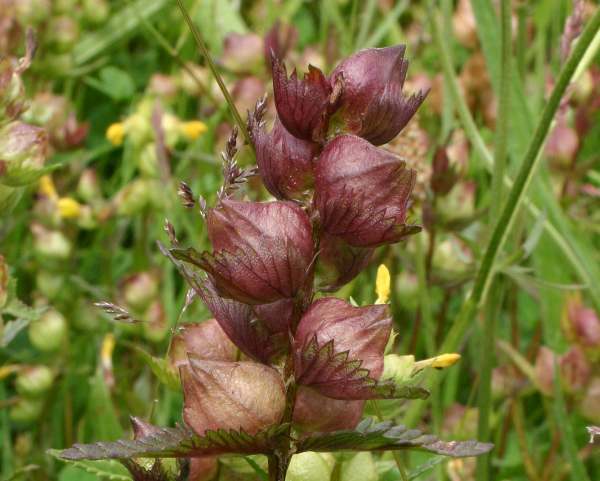 From May to September is the normal flowering period for Yellow Rattle in Britain and Ireland. When the wind blows in the autumn, the seeds rattle inside the sepal tubes (seed pods) of this strange plant of grassy slopes and wildflower meadows; hence its common name. It has also been accorded other names that refer to the rattling of the seeds including 'Pots and Pans' and 'Hay Rattle'. 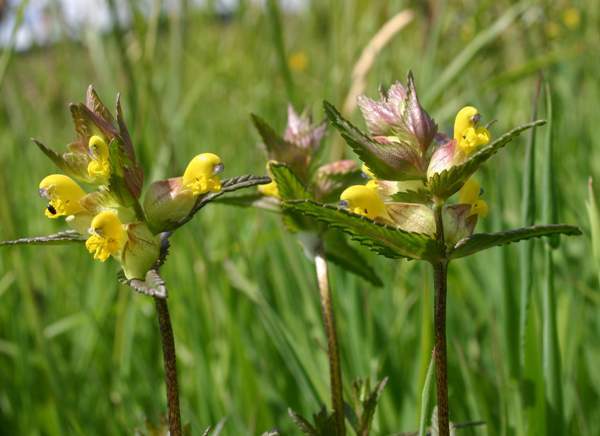 Yellow Rattle is hemi-parasitic and depends on other nearby plants, notably of the families Poaceae (grasses) and Fabaceae (peas, vetches and relatives), feeding on their roots to gain some of its nutrients. Pictured above are the seedheads of Yellow-rattle. When blown by the wind the seeds inside make a rattling noise. The plants shown on this page were photographed at Kenfig National Nature Reserve in South Wales in June and July.